Contact me now if you have something to sell. From a small or large collection of better stamps to entire dealer stocks, no matter how large please contact me now by using this special sellers form. I will be happy to respond immediately to your offer to sell to me. United States collections valued at $5,000.00 or more. High quality single stamps, U.S. and worldwide. Specialized collections, postal history, locals, etc. from all areas are needed. Rare stamps, U.S. and worldwide. Stamp dealer stocks, store inventory, mail order and show dealer stocks. Worldwide, single country and topical collections valued at $5,000.00 or more. Error stamps. Specially new discoveries on recent issues. Accumulations, mixed lots, bulk properties of valuable stamps. They don't have to be organized. We are buying better stamps only. Common material is not wanted at this time. Please click here to see a current list of just a few of the specialized stamps I need right now. Unorganized accumulations of used stamps in envelopes, bags, boxes, tins, etc. Children's stamp albums and collections with less than a few thousand stamps. Stamps and covers issued by promotion houses, such as The Postal Commemorative Society, The Fleetwood Co. and sold via monthly payment plans. We are not buying foreign postage lots at this time. In addition: I can't appraise a stamp or a collection by phone. Try sending a few photos. At least I can then tell you if you have something we would buy. Six good reasons to sell now. Right now stamp prices are high and I will pay top dollar for your stamps. You will receive payment for your stamps right away. No waiting. I will buy all your stamps and pay you full value. I have over 60 years of expertise to value your stamps fairly and accurately. You will be treated with honesty, courtesy and respect. My need for rare and valuable stamps has never been greater. 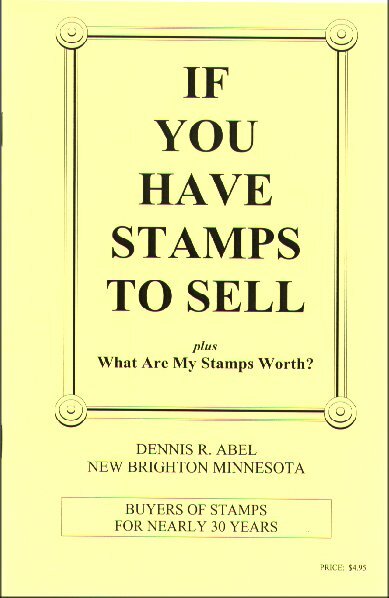 about selling your stamps please consider ordering my pamphlet IF YOU HAVE STAMPS TO SELL plus What Are My Stamps Worth? Priced at $4.95. Includes mailing and handling in the U.S.A. When you have stamps for sale, arm yourself with the information in my pamphlet and then deal with an established reputable buyer. Appraisals - What are they? How do I get one? What should I expect to pay for one? Stamp Catalogues - What are they and how can I use one for free? Offers to Buy - How do I go about getting them and how do I know who to trust? How do I know I am not being cheated? How can I find out how much my stamps are valued at...FOR FREE?